The water on the Left is AMD, flowing directly, untreated into the hippodam in the Krugersdorp Game Reserve – not the bright yellow colour of the iron and uranium in the water. The water on the Right side on the photo, is a fawn-coloured brown – this water is water treated with a buffering medium – calcium carbonate – the pH of the water on the Left is 2.6 and on the right as high as 9 – 10. Rand Uranium concedes that they can’t get the pH corrected. They manage to raise the pH further upstream, but by the time the two streams merge, the pH is totally out of control again! 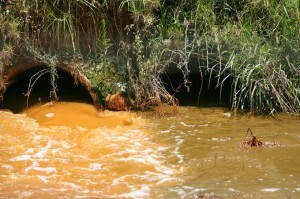 The extreme variations in pH, along with the high toxic metal content, along with the high volume of sulphates in the water (upward of 2500 ppm) makes for a river of death, which will affect vegetation, aquatic life, bird-life, animal life (especially in the Krugersdorp Game Reserve, as it is hardest and first hit!) and downstream it will affect farmers and low-income communities, who rely on the water for everyday living. This is an appeal for community groups to mobilize and meet and demand that government – local and national – provide compensation and action plans which won’t just stabilize the acid mine drainage, but also address the current ecological disaster and immanent loss of animal life, vegetation and its impact on poorer communities and farmers who make a living out of crops irrigated by this acid contaminated water! 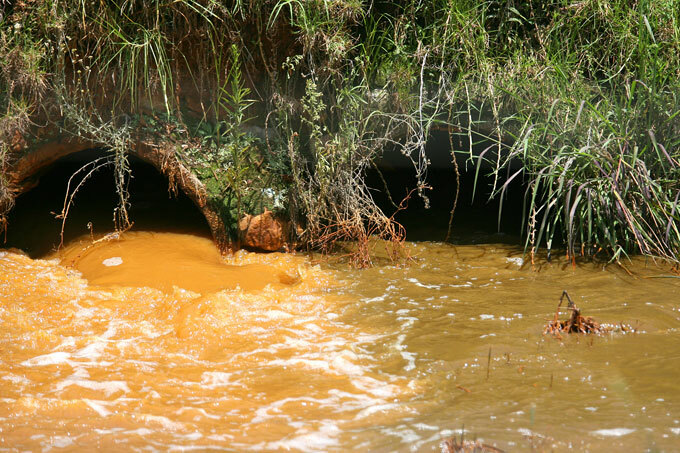 Acid mine drainage: What is it?